Do Orthotics Work for the Treatment of Plantar Heel Pain? Heel pain is a common foot problem. The sufferer usually feels pain either under the heel (planter fasciitis) or just behind it (Achilles tendinitis), where the Achilles tendon connects to the heel bone. There are 26 bones in the human foot, of which the heel (calcaneus) is the largest. The human heel is designed to provide a rigid support for the weight of the body. When we are walking or running it absorbs the impact of the foot when it hits the ground, and springs us forward into our next stride. Experts say that the stress placed on a foot when walking may be 4-5 times our body weight, and up to 10 times when running. Consequently, the heel is vulnerable to damage, and ultimately pain. The most common causes of heel pain are plantar fasciitis, partial rupture of the plantar fascia. The plantar fascia is a strong bowstring ligament-like structure that runs from the calcaneus (heel bone) to the ball of the foot. When the plantar fasciitis is over-stretched repeatedly its tissue fibers will rupture, usually where it attaches to the heel bone. Sometimes the problem may occur in the middle of the foot. Pain under the foot can occur, especially after long periods of rest. Heel bursitis can also cause heel pain due to inflammation of the back of the heel. Pain in the heel can also come from tarsal tunnel syndrome – a large nerve in the back of the foot becomes pinched or compressed. Chronic inflammation of the heel pad can cause pain to radiate from the heel, this is caused either by the heel pad becoming too thin, or heavy footsteps. Heel pain also occurs from displacement of the ankle and heel bones. It is estimated that 1 in 10 people will have at least one episode of heel pain at some point in their life. With this many people suffering from plantar heel pain, many will turn to foot orthoses, commonly known as arch support or orthotics. Is this really the best form of “treatment” though? According to IndustryArc, the global “Foot Orthotic Insoles Market” registered revenues of nearly $2.5 Billion in 2014 and is that dollar amount is estimated to grow 5.8% to reach $3.5 Billion by 2020. 45% of those sales occurred in the North America. This is an indication that there are a lot of people dealing with foot concerns such as misaligned feet and plantar heel pain that are willing to spend money in hopes of getting relief. The only problem is that there is little to no evidence that something placed in your shoe can actually have a positive effect treatments such as plantar heel pain. In a recent study reported by the British Journal of Sports Medicine of randomized controlled trials comparing foot orthoses with a control (defined as no intervention, sham or other type of conservative treatment) reporting on pain, function or self-reported recovery in patients with plantar heel pain or PHP. The results of the twenty studies investigating eight different types of foot orthoses were included in the review. Most studies were of high quality. Pooled data from six studies showed no difference between prefabricated orthoses and sham orthoses for pain at short term (mean difference (MD) of 0.26 (95% CI −0.09 to 0.60)). No difference was found between sham orthoses and custom orthoses for pain at short term (MD 0.22 (95% CI −0.05 to 0.50)), nor was there a difference between prefabricated orthoses and custom orthoses for pain at short term (MD 0.03 (95% CI −0.15 to 0.22)). For the majority of other interventions, no significant differences were found. View the study. Foot and arch supports both over-the-counter (OTC) and hand-made custom-made devices continue to be discussed. 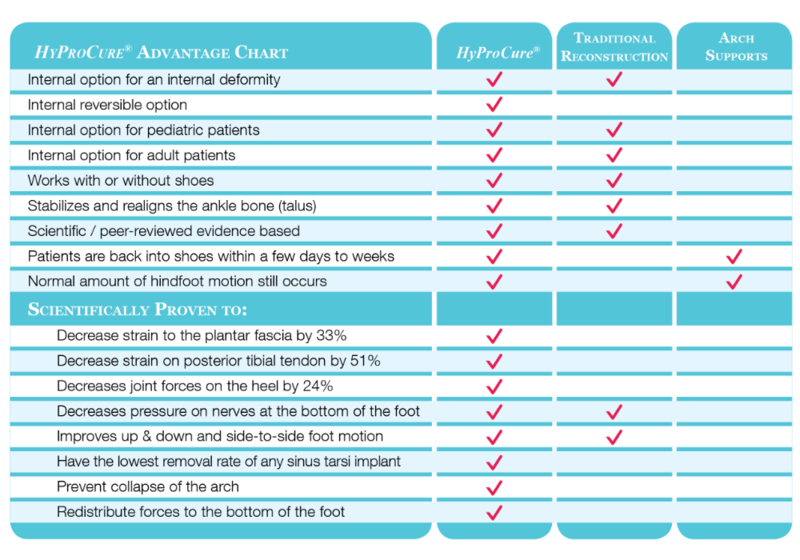 The overwhelming consensus is that these devices have a limited ability if-any to control plantar heel pain. Where is the “science” to back up the claims that foot orthosis can prevent PHP, calcaneal eversion, navicular drop, or rebalance the 1st ray instability? This is a major problem with the use of arch supports and that it is an unregulated industry. All kinds of false claims can be made without penalty. Anything placed into someone’s shoe will give the sensation of a different feeling, but that does not mean that the underlying condition is fixed. Imagine someone was a diabetic and the only form of treatment is simply to make sure the patient doesn’t end up in a diabetic coma. Or another example is someone with hypertension, should the goal be focused purely on the symptom relief? Of course not, the goal is to normalize their blood pressure. 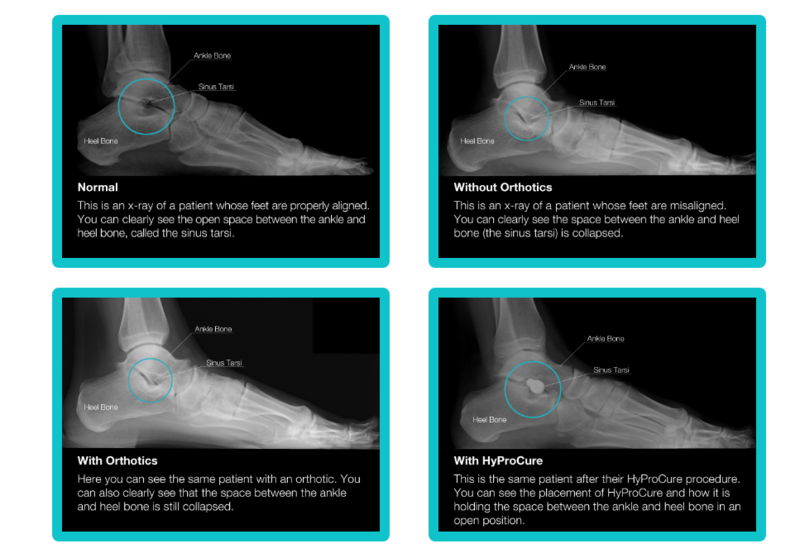 The standard of care for the treatment of a misaligned foot should be that the foot is realigned and that there are pre- and post-treatment measurements made to validate the realignment that are reproducible from clinician to clinician. When “fixing” a problem, it is crucial to understand the underlying etiology. So we must ask the question, what is the exact cause of plantar heel pain? This simple question is critical in the treatment of most musculoskeletal pathologies to the foot, ankle, knee, hip, and back. Yet, the vast medical professionals who treat these pathologies have failed to make the connection between the symptom and the underlying foot alignment pathology. The goal is treatment is not to just cover up the symptoms, but rather fix the underlying problem. Arch supports cannot fix plantar heel pain, they try to reduce it. Foot orthosis are therefore a sub-therapeutic form of treatment. A good example is a patient who is a poorly controlled insulin-dependent diabetic. The goal is not to keep the patient symptom-free, it is to normalize their blood sugar level. Diet only cannot help. Just like shoes cannot “fix” over-pronation or talotarsal joint instability. Oral medications may help a little to lower the blood glucose, but it cannot normalize blood glucose in a type I, insulin dependent diabetic. Similarly, arch supports cannot realign and stabilize the talus on the calcaneus. The only way to normalize the blood sugar levels is to have insulin injected into their body. Likewise, the use of a sinus tarsi implant is a superior option over arch supports to realign the talotarsal joint. Many medical professional feel that it is better to offer a “conservative” option rather than performing a corrective surgery. While this may seem to make sense, further analysis reveals that it doesn’t make sense at all. Should a patient wait months or years to normalize their blood sugar levels? There is an evidenced-based, proven solution to the realignment and stabilization of the talotarsal joint, called Extra-osseous talotarsal joint stabilization (EOTTS). It’s an amazing option that is time-tested. It fixes the deformity while still allowing a normal range of motion. Symptoms such as plantar heel pain, back pain, overpronation and more can be greatly reduced if not completely eliminated. Taking a look at the treatment comparison chart below shows that EOTTS- HyProCure® is the superior option back up with published studies. 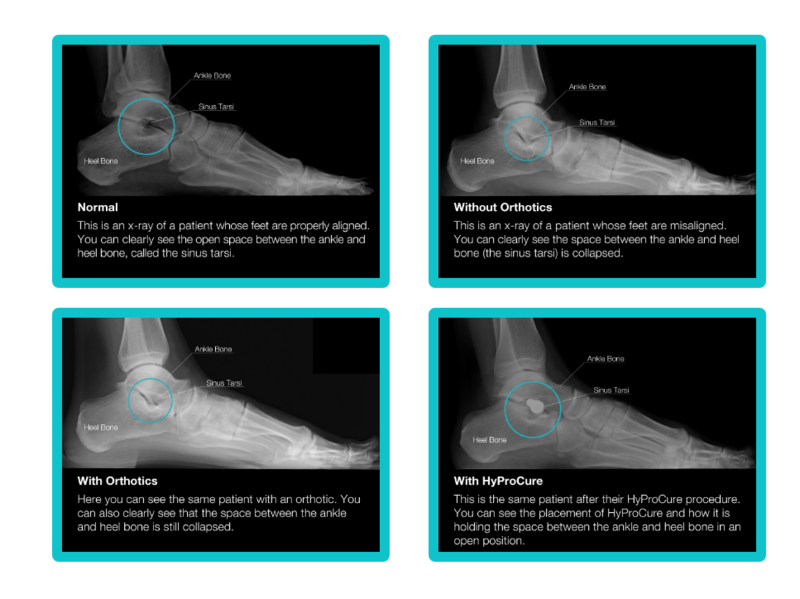 HyProCure is scientifically proven to decrease strain to the plantar fascia by 33% and decrease joint forces on the heel by 24%. Millions of patients around the world are told to try a subtherapeutic form of treatment. Every year the number of patients suffering with chronic musculoskeletal complaints continues to raise. Just like the medical expenditures on the treatment of chronic musculoskeletal disease. The time has come to expose foot inserts as below the standard of care in the treatment of talotarsal joint instability and to recommend a better form of treatment that actually does the job of realigning and stabilization the talotarsal joint.